What Insightly Triggers and Actions are Supported? New Project - Triggers when a new project is created within your Insightly account. New Organization - A new organization was created in your Insightly account. New Contact - A new contact was created in your Insightly account. New Task - A new task was created in your Insightly account. New Lead - Triggers when a new lead is created in your Insightly account. Create Project - Creates a new project in your Insightly account. Create Opportunity - Create a new opportunity in your Insightly account. Update Contact - Update a contact. Create Organization - Create a new organization in your Insightly account. Create Contact - Create a new contact in your Insightly account. Create Task - Create a new task in your Insightly account. Create Lead - Create a new lead in your Insightly account. Create Note - Create a new note in your Insightly account. Find Opportunity - Searches for an opportunity by name. Find Lead - Searches for a lead by email address. Find Organization - Searches for an organization by name or email domain. Find Project - Searches for a project by name. Find User - Searches for a user by email address. Find Contact - Searches for a contact by email address. The first thing you'll need to do is select Insightly either as an action or as a trigger. 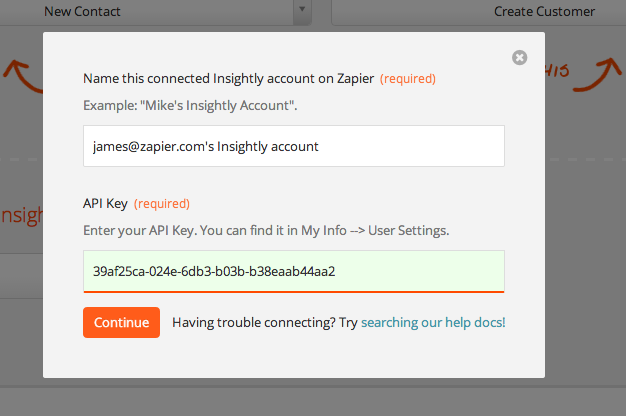 The next step is you'll need to add your Insightly account to Zapier. This can be found by logging in to your Insightly account, clicking the profile icon in Insightly and select User Settings. On the next page, scroll to the bottom to locate your API key. Copy and paste that into the connected account account box! If all works well you should see the following with a successful account validation. If it fails you should check to make sure you copied the API key and removed any whitespace before or after it. This integration works by looking at new contacts that have been created within the last hour. So you may want to create a fresh contact to test with as you set the zap up.